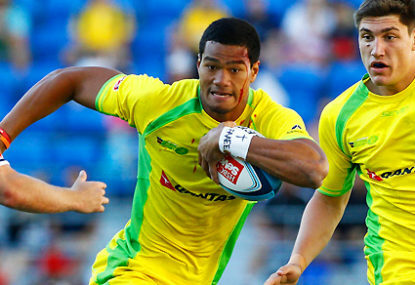 Sydney will be the new host city of the Australian leg of the World Rugby Sevens Series from the 2015/16 season, after it was announced today it would move from the Gold Coast. After four years at Robina, the Australian Rugby Union decided to switch the tournament to Sydney’s Allianz Stadium. With the crowd at the 2014 edition of the Gold Coast tournament below expectations, there have been reports of the move to Sydney since late last year. The ARU confirmed the move today, taking the Sevens tournament back into a major rugby city for the first time since 2003, when it was held at Ballymore in Brisbane. The tournament was also hosted by Adelaide from 2006 to 2011. ARU CEO Bill Pulver said the ARU was thrilled about the move. “We are thrilled to be able to bring Rugby Sevens to Sydney. We truly believe that Sydney has the potential to match the excitement surrounding tournaments like Hong Kong, Twickenham and Wellington in terms of event experience and crowd numbers. “Sydney is an iconic city known across the world for its cultural diversity, outdoor lifestyle and stunning tourist attractions. It is a terrific fit for an event that traditionally attracts an audience from a variety of different nationalities and backgrounds. “There is little doubt the area in and around Moore Park lends itself to Rugby Sevens. We had a stadium record crowd at Allianz Stadium in June with plenty of exciting Test Rugby on the field, and wonderful off-field entertainment at the Sydney Cricket Ground. World Rugby Chairman Bernard Lapasset was pleased with Sydney as the new venue for the tournament. Australian Director of Rugby Sevens Geraint John, said: “I have already experienced first-hand the passion Sydneysiders have for Rugby, whether it be through their support for the national team, their state or club Rugby.